Erik Swanson wasn’t gone for long. Three days after the Mariners optioned him to Class AAA Tacoma, Swanson, a 25-year-old right-hander, is back on the big club, taking the place of injured left-hander Wade LeBlanc. 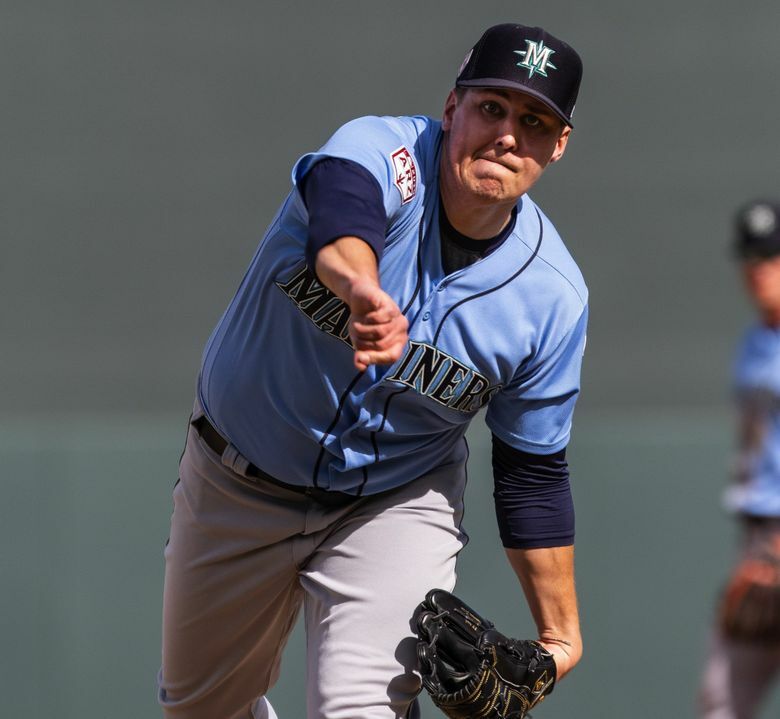 The 34-year-old LeBlanc was placed on the injured list Sunday after suffering a Grade 2 oblique strain during the fifth inning Friday against the Astros and could miss four to six weeks, according to Seattle manager Scott Servais. LeBlanc had posted a 2-0 record with a 4.50 ERA in three starts this season. The plan, Servais said, would be for the veteran to begin throwing in roughly three weeks and then go through a rehab start, barring a setback. Until then, though, Swanson looks primed to steal a spot in the rotation. It’s a bit of an unusual position for Swanson, who is primarily a starter. So how does one prepare to potentially bounce between the bullpen and rotation? “I kind of just focus on today, and if for some reason I end up throwing today I’d make the adjustment afterward and try to get ready for whenever they need me next, whether that’s starting or back out of the pen,” Swanson said. “It’s a little bit of an adjustment to make, being a starter over the last few years of my career and then going to the pen. It should also be easier now, considering Swanson’s major-league debut is out of the way. The Terrace Park, Ohio, product threw two innings and struck out four, surrendering three hits and two earned runs, in a victory over the Royals on Thursday. Added Servais: “He threw well. He’s got a good fastball. The fastball’s got some riding action on it. He got a lot of swings and misses on it. The goal, for Swanson, is to utilize his strengths … and hopefully stick around for more than a day or two. “He’s a pretty mature guy,” Servais said. “He knows who he is, and I think sometimes when young guys get to the big leagues they don’t quite know who they are yet. He knows what makes him successful and where he needs to pitch or take his pitches in certain parts of the strike zone. The Mariners made another roster move Sunday, dealing catcher David Freitas from Tacoma to Milwaukee for minor-league right-handed reliever Sal Biasi. Biasi, 23, did not allow a run in three relief appearances with Class A Wisconsin this season, striking out five and walking two in four innings pitched. The Hazel Township, Pa., product was selected by Kansas City in the 11th round of the 2017 MLB first-year player draft out of Penn State, before being dealt to Milwaukee in August 2018. Freitas appeared in one game with the Mariners this season, going 0 for 2 with an RBI, a run scored and a walk in the home-opening victory over Boston on March 28. In 36 games with Seattle last season, the 30-year-old catcher hit .218 with 11 runs scored, eight doubles, one homer and five RBI. The Mariners addition of 28-year-old catcher Tom Murphy last month made Freitas suddenly dispensable. Infielder Ryon Healy had played in all 17 games this season, so it was time for a break. He did come in late in the game Sunday to replace Dylan Moore at third base. The 27-year-old Healy is hitting .250 so far this season with three homers, nine doubles and 12 RBI. Speaking of third basemen, Servais said Sunday that 31-year-old infielder Kyle Seager — who has spent the first several weeks of the season on the 60-day IL with a left hand injury — is making positive strides. Servais added Seager has thrown in a cage but has yet to do any work on the field. Sunday marked the season’s first Bark at the Park Day at T-Mobile Park, when fans are invited to bring their dogs to the stadium. There were a lot of dogs. Prior to the series finale Sunday, the Masters golf tournament was broadcast on the video board. And each time Tiger Woods appeared on screen, some quick-thinking (and apparently bored) T-Mobile employee sprang into action, appropriately blaring Survivor’s “Eye of the Tiger” through the stadium speakers. Tiger sank a putt, and the music played. The camera panned to Brooks Koepka, and the music abruptly cut. On and on it went — a song and dance (and drive and putt) — until Woods finally won his first major title in 11 years. And the stadium’s designated DJ wasn’t the only one who took notice.